After my recent rendezvous with the voluminous War and Peace and the depressing Siya Seth, I was desperate to read a breezy, light hearted, easy-on-brains entertainer. In fact, Maya Running was the last such book, I had read and really enjoyed. So, I literally jumped with joy, when I received my copy of ‘High School Love’, courtesy Diamond Pocket Books. The lovely portrait of two young ones, madly in love with each other, depicted on the cover page of the book attracted me and I got ready to spend a memorable evening with Chocoholic Shadow’s first love. CHOCOHOLIC SHADOW – a name that appeared on the front cover and intrigued me enough to turn pages hurriedly and read more about the author at the back page. However, all I could understand from the intro was that CS is a Twelfth class student from Kota, who loves writing poems and HSL is his debut novel. An obscure author with a fictional name did not appeal to me, but my tryst with The 3 Mistakes of My Life and God of Small Things, have made me wiser and I have firmly resolved not to focus on author’s name and reputation, but, to simply concentrate on his/her work. So, bursting with my embrace-all attitude, I accepted the HSL graciously and endeavored to read unbiasedly, resolving to concentrate only on the fun part, as the book is marketed as a teenage romance. But, at times, first impression is not the last impression, and I learned it the hard way. Little did I know that the trailer was the only interesting part of this movie. In the first chapter itself, all my graciousness and calmness evaporated. I was confronted by tortuously long obscure sentences, written in shoddy English without any care for punctuations. Before I digress any further, to follow the convention, let me tell you a little about the story. The novel is written in the first person by a High School student Aryan. The story begins with the declaration of Aryan’s Board results. He scores low and is forced by his parents to opt for commerce, despite his insistence on choosing Science. Well, after much persuasion and turn around, Aryan lands in Kota and is enrolled in the hip Modern School. 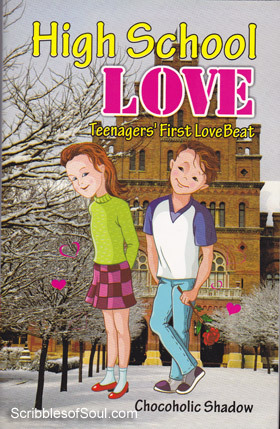 As is evident from the title itself, the romance happens on the very first day, as our dear Hero falls in love with the smartest girl of the school, Akriti. For the first few chapters, there is hardly anything except the one sided love pangs experienced by the teen hero, in this uni dimensional single agenda love story. However, down the line, the “brill” CS does invent some more characters, to add spice to the otherwise too sugary puppy love story. The characters of reclusive Anvita, love birds Tanmay and Ishita, and studious Bhavya, do give a platform for Aryan’s budding romance. They help Aryan in wooing Akriti and soon the duo are madly in love with each other, and ready to make a life long commitment. To add more spices to the otherwise insipid oft repeated tale, the scene is shifted to Hyderabad, where Aryan and Akriti frantically swing on the love ride and discover the finer nuances of intimacy and adulthood. Well, there is nothing new in the story. But, it could have been made interesting, if only the author could woo his readers with some real witty remarks or entice with some high rated emotional drama. The only event that I liked in this book was a yahoo chat between Aryan and Akriti, that seemed natural and where CS does impress with his small affable talks. But, the conversational style adopted to establish a rapport with the modern generation has, in general, backfired. It is indeed an atrocity to expect the readers to survive 250 pages written in bad English. The trick to use cool slang would have worked, if only it was supported by a good story, so that the reader be so engrossed in the book that he forgets all about the lack of proper language. However, in the absence of any coherent emotional attachment, I soon lost my interest in the novel and could not connect with it. In fact, in the initial pages itself, I was annoyed with the incorrect English and was forced to read the novel with a pencil in my hand, correcting the mistakes, so that I can at least understand the book. Words are just like bricks, one needs a skilled artisan to build a strong castle out of it. And irreverence towards the syntax of English made the novel appear as a shabbily written, slanged, sms-lingoed juvenile diary of a wannabe cool teen sensation. As for now, ‘High School Love’ ranks pretty low on my reading list. Well. I hope you have not put attention on few points. 1. Writer is young Indian boy not an English Prof.
2. Story depicts the today’s teen age school days other then school hour. 3. The new writer’s write up always lost its freshness. 4. And fact so much has been written by now that it is really tough to find good or fresh vocabulary without the help of dictionary. 5. This is not a work aim for NOBEL- simply to give words to imagination. CS, just like it isn’t a brush which creates a work of art, it isn’t the vocabulary which creates an award winning novel. Hope you take this review as constructive criticism from one of your readers, rather than bashing! Wow, it seems that this book is really appreciated and famous amongst the vocabulary deficient crowd! is this a novel or an english grammar book guys……..
grow up all the ppl whi hav ny problem with book regarding language…. i had a tremendous entertainment of non-stop 5 hrs of reading this book…..looking forward for your another 1…. hey anu can u jst tell show me the mistake stht he made in the novel.. even i couldnt connect to it at times.. bt m not able to figure out where his english was incorrect so plzz can u jst update a post wid few of his mistakes and corrections to it,!! its an humble request please,,!! This book is the “GUNDA” of all bad books. What’s the name of its 2nd part? Have 2nd part occurred? What is its name?